December 1: Carol Mary Hedd - NL Classifieds baseball hat, magnet, cup, pen, drawstring bag, Auk Island Wine, Starbucks Chocolate Advent Calendar & Gift-card. December 2: Karla Sceviour - NL Classifieds baseball hat, magnet, cup, pen, drawstring bag, Jungle Jim's Gift Card, Cineplex Date Night Gift Card. December 3: Mitchell Petten - NL Classifieds baseball hat, magnet, cup, pen, drawstring bag, Auk Island Wine, Hickman's Automotive Group Gift Card, Purity Factories Gift Pack. December 4: Stephanie Lynch - NL Classifieds baseball hat, magnet, cup, pen, drawstring bag, Arctic West Gift Card, Gander Toyota Hat, Chocodelice Box. December 5: Samantha Byrne - NL Classifieds baseball hat, magnet, cup, pen, drawstring bag, Merle Norman Cosmetics Gift Packs & Facial Gift Certificate, Guylian Chocolate Box. December 6: Crystal Costello - NL Classifieds baseball hat, magnet, cup, pen, drawstring bag, St. John's IceCaps Tickets (Dec 11 vs Rochester) Godiva Chocolate Set, Lindor Chocolate filled Mug. December 7: Nichole Lewis - NL Classifieds baseball hat, magnet, cup, pen, drawstring bag, Purity Factories Gift Pack, Arctic West Gift Card, Gander Toyota Hat. 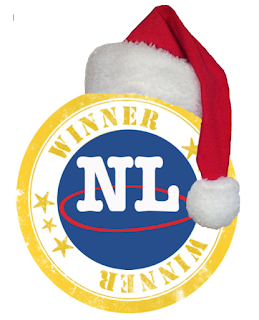 December 8: Michael Whelan - NL Classifieds baseball hat, magnet, cup, pen, drawstring bag, Auk Island Wine, Balsam Christmas Wreath, Lindor Chocolate filled Mug. December 9: Vanessa Crane - NL Classifieds baseball hat, magnet, cup, pen, drawstring bag. Hickman's Automotive Group Gift Card, St. John's IceCaps Tickets (Dec 12 vs Rochester), Lindor Chocolate filled Mug. December 10: Kasiah Goiziou - NL Classifieds baseball hat, magnet, cup, pen, drawstring bag, Gander Toyota Jacket, Sweet Revelations Stone Platter, Auk Island Wine. 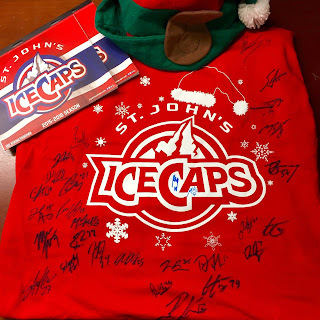 December 11: Kim Chayter Rex - NL Classifieds baseball hat, magnet, cup, pen, drawstring bag, Chocodelice Box, Lindor Chocolate filled Mug, St. John's IceCaps Tickets (Dec 15 vs Albany). 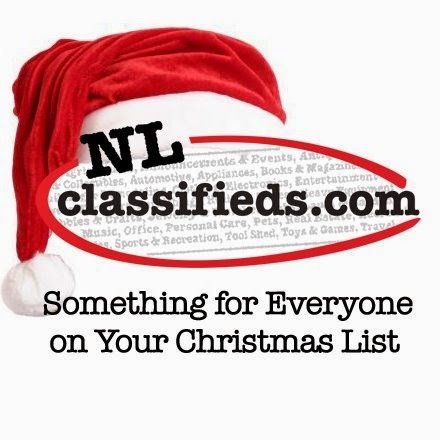 December 12: Rhonda Hillier - NL Classifieds baseball hat, magnet, cup, pen, drawstring bag, Balsam Christmas Wreath, Auk Island Wine, Lindor Chocolate filled Mug. 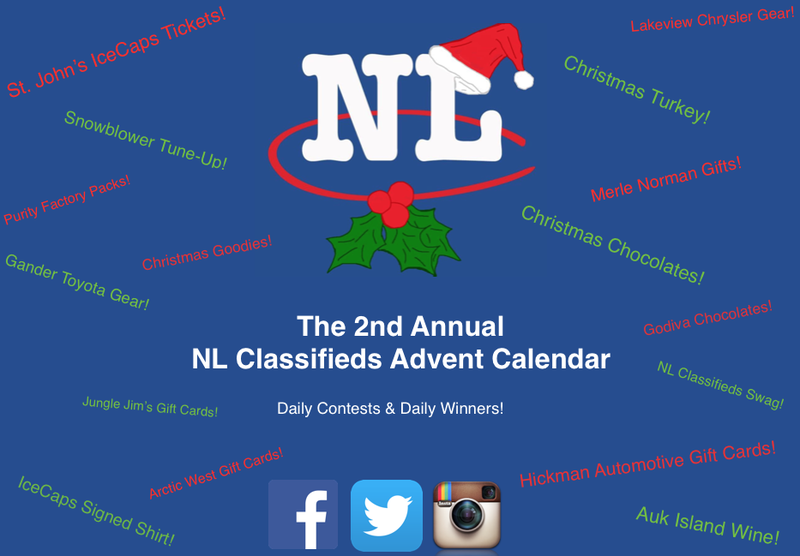 December 13: Chris Hart - NL Classifieds baseball hat, magnet, cup, pen, drawstring bag, Hickman's Automotive Group Gift Card, St. John's IceCaps tickets (Dec 16 vs Albany), Lindor Chocolate filled Mug. December 14: Shawn Keats - NL Classifieds baseball hat, magnet, cup, pen, drawstring bag, Purity Factories Gift Pack, Arctic West Gift Card, Guylian Chocolate Box. December 15: Elaine Pelley - NL Classifieds baseball hat, magnet, cup, pen, drawstring bag, Christmas Turkey, Hickman's Automotive Group Gift Card, Lindor Chocolate filled Mug. December 16: Walter Noseworthy - NL Classifieds baseball hat, magnet, cup, pen, drawstring bag, Jungle Jim's Gift Card, Auk Island Wine, Chocodelice Box. December 17: Lorna Hann - NL Classifieds baseball hat, magnet, cup, pen, drawstring bag, Hickman's Automotive Group Gift Card, Arctic West Gift Card, Lindor Chocolate filled Mug. December 18: Joanna Snelgrove - NL Classifieds baseball hat, magnet, cup, pen, drawstring bag, Auk Island Wine, Purity Factories Gift Pack, Lakeview Chrysler Sweater. December 19: Ryan Garland - NL Classifieds baseball hat, magnet, cup, pen, drawstring bag, Auk Island Wine, Gander Toyota Hat, Lindor Chocolate filled Mug. December 20: Jenna Roddick - NL Classifieds baseball hat, magnet, cup, pen, drawstring bag, notebook, Auk Island Wine, Sweet Expressions Gift Basket, Lindor Chocolate filled Mug. December 21: Amy Heffernan - NL Classifieds baseball hat, magnet, cup, pen, drawstring bag, notebook, Godiva Chocolate Set, Snowblower Tune-Up from Scope Industrial. December 22: Trina Oake - NL Classifieds baseball hat, magnet, cup, pen, drawstring bag, notebook, Guylian Chocolate Box, Gander Toyota Hat, Lindor Chocolate filled Mug, Auk Island Wine. 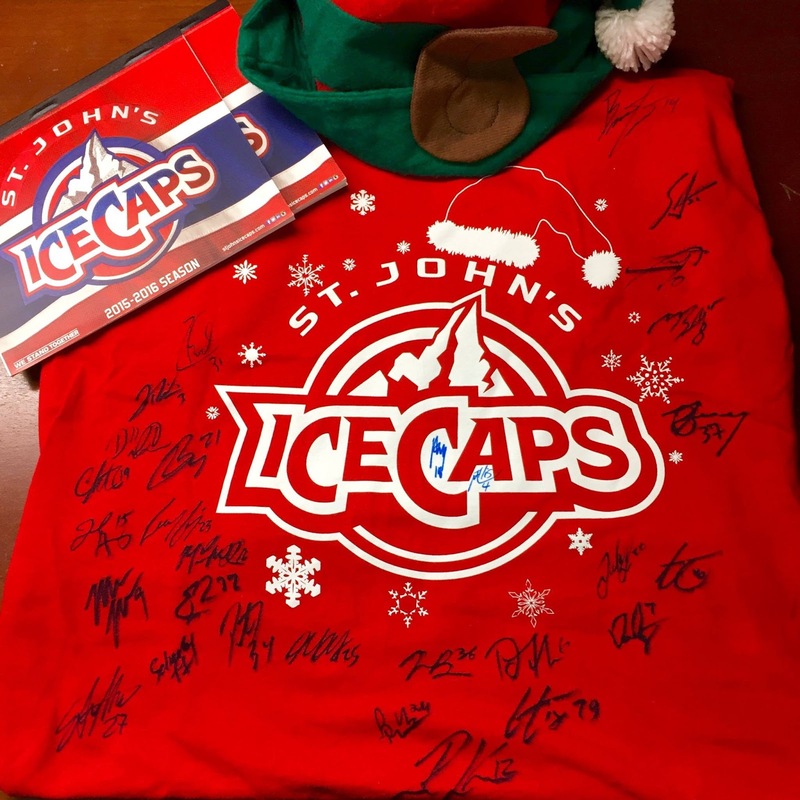 December 23: Victoria Hogarth - NL Classifieds baseball hat, magnet, cup, pen, drawstring bag, notebook, toque, Auk Island Wine, Pie in the Face game, Lindor Chocolate filled Mug, St. John's IceCaps Christmas Shirt signed by entire 2015-2016 team. December 24/25: Ashley Rumboldt - NL Classifieds baseball hat, magnet, cup, pen, drawstring bag, notebook, toque, Lindor Chocolate filled Mug, Auk Island Wine, Hickman's Automotive Group Gift Card, Purity Factories Gift Pack, Sweet Expressions Gift Basket, St. John's IceCaps tickets (Jan 8 vs Portland). Winners are required to message NL Classifieds through one of the three social channels to arrange prize collection. Prizes are not required to be collected same day. Prizes must be collected within 30 days of winning. We look forward to having even more fun, with even more prizes here in 2015!! We hope you will enjoy our countdown as much as we will. 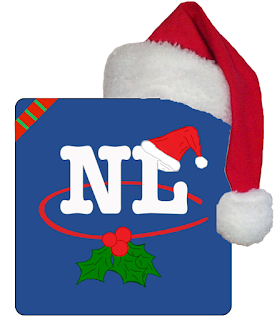 We look forward to seeing you on www.nlclassifieds.com and hearing from you on our social media channels - Happy Holidays! !